Visit Scotland are shortlisted in the Travel and Leisure category for their 'Operation Shetland Ponies in Cardigans'. Here's part of a Q&A we had with Social Media Manager, Simone Kurtzke. What do you think really made this project stand out? One: hard, measurable, business results. The project showed how ‘social media’ (and I’ve put the quotes in on purpose! 2013 means the end of silos) isn’t just some top of funnel engagement thing with no measurable business value (ROI). In fact this project demonstrated the opposite! We actually reduced our average cost per visit - one of the current business metrics - by 98%, and the average cost per social acquisition by 70%. And that’s even without looking at the long-term SEO benefits, decent SERPs invasion and search engine coverage (147k Google mentions), and some great new relationships we managed to form. Plus, we’re now on the radar of high-quality websites including Gawker.com and Boingboing.net! Two: integration, integration, integration. This project shows how digital excellence isn’t tied to just digital practitioners - we don’t and shouldn’t just sit in digital silos. Rather, the project stands out as it illustrated how digital is at its most powerful when closely aligned with existing expertise - in this case, our in-house PR team. We piggybacked on the internal team’s media relations activity and our focus was on transitioning this online - creating the right type of content, sharing it in the right places and following up with the most valuable sites, to help build long term SEO value and aiding exposure to VisitScotland.com. Arguably, only through this agile integration of SEO, PR and Social, the campaign achieved not only its very strong initial visibility but also considerable long-term SEO value. While it’s not purely digital, I have to mention Three’s Dancing Ponies (#danceponydance). 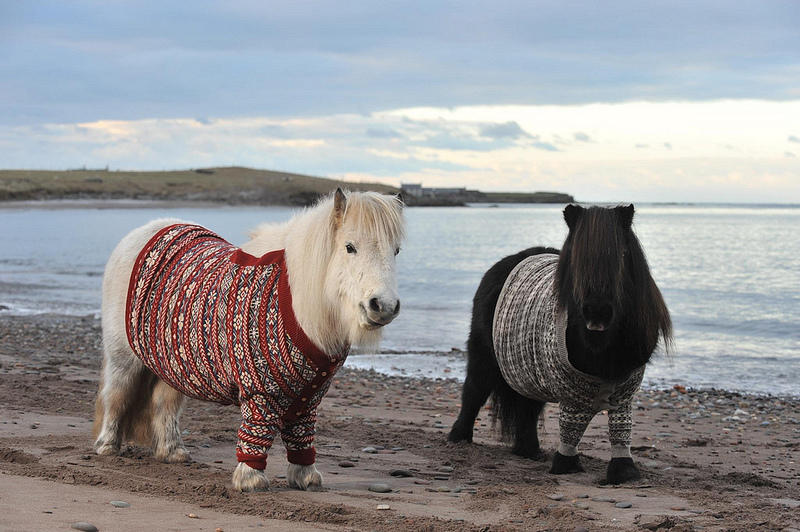 It was a crazy coincidence because Three’s campaign happened just after our own ‘Shetland Ponies in Cardigans’ went viral, and Three’s PR guys actually got in touch to let us know #danceponydance was about to be unleashed. Both campaigns had quite a bit in common - simple, cute, and built around emobait. That is, they pushed some very primordial emotional buttons which made it almost impossible to not love it and in fact eliciting an action (not just sharing it - but also actual holiday bookings to Shetland, as we found out). Kelsey Libert of Frac.tl recently published an excellent article on SEOMoz which talks about exactly that - how the best content marketing tactics are guided by a scientific approach. They use psychological insights about how to trigger emotional responses which in turn lead to actions. We all know that emotions drive almost all human behaviour and we’re not in fact some rational, in control person. Cialdini’s ‘Influence - The Psychology of Persuasion’ is one of my marketing bibles. So, any campaigns that are able to trigger emotions and thus actions have my vote. It doesn’t necessarily have to be soppy ones - I similarly love Netflix’ current http://insertmeanywhere.biz to promote the new season of "Arrested Development as it’s just funny in really cheesy, Alan Partridge-like way, and it makes it easy for people to get involved (without having to create an entire video from scratch. I really dislike ‘create an original video to enter’ campaigns - far too much hassle!! ).